If you’re interested in sewing, chances are that the creative process fascinates you. Yet, sometimes it’s helpful to have inspiration on adding details to make a style your own! Amy Barickman, of Indygo Junction, has mastered the art of personalizing patterns. She joined me on Sewing With Nancy for a 2-part series, One Easy Pattern—Six Terrific Looks. The first version of the featured jacket highlights the fabric. The swing silhouette with the mandarin collar lets the fabric be the focal point. We’ll then use this easy-sew style to add our creative touches. For our second terrific look, make a statement with a framed, super-sized covered button. Needle Felting was added to the covered button fabric—an accent that can be completed in mere minutes. Then add framing, a rectangle of fabric behind the button—it’s now Button Art! Easy-to-sew fleece is the perfect palette to showcase two terrific techniques. For our third option, we started with a free-form needle felting design—it adds great impact. We enhanced the jacket even further with a whip stitched edge. You’ll enjoy learning the magical tip that ensures all the stitching will be perfectly even! The pattern, book, and DVD are available as a terrific combo: One Easy Pattern—Six Terrific Looks. For a chance to win a copy of One Easy Pattern—Six Terrific Looks vote for your favorite look. Three more looks are coming next week. Vote once this week and again next week by posting a comment below. A random winner will receive the book/pattern combo. 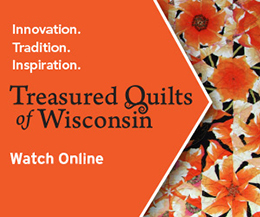 Watch this episode on your local PBS station, online, or on your iPad, iPod Touch, or iPhone. By the way, the new Sewing With Nancy app is very popular. Have you downloaded the app? Number 4 is my choice! Sew casual yet elegant! Anxious to try, looks easy!! Gotta love look #3, the fleece jacket. Love your choice of fabrics! This is a wonderful pattern. How cool is that?! My fave for this trio is the fleece one (#3). Love my Sewing with Nancy!! I like view 3. I think you can do alot with the pattern. I like all of them but the freatured fabric coat stands out today. Could be because I am looking for some color today. What a fun pattern! I have so many ideas for it! Red is my favorite color, so that is my pick. They’re all really cute, but I like the one with the large buttons the best. The color reminds me of Spring! I like the pink one since bright colors are my favorite. It would be fun to try all the different ideas. It was hard to choose, but I settled on the Button Art coat. Ingeneous ideas on how to change a pattern’s look by using your imagination. Can’t wait to make some of these coats. I’ve been following “Sewing With Nancy” since the late 80′s when I video taped on our old VSH machine. Now I do it via a PVR recorder. I retained our old TV with a built in tape player so I can refer to them anytime. Love your shows and your guests. I like the fleece version. I vote for the first one–love, that fabric and the symmetry across the front. I love the button art! What a great look by just adding fabric behind a large button. Look #3 has my vote this week. Simple and dramatic at the same time. I love the look #3. The solid color is more slimming than the wild fabric and this is what I need. I have been looking for a casual, easy to make jacket and this looks like it would be it. I love view number 3. I like the look of felting a flower on it. And making it out of fleece would be so warm and cozy. Hard to see it up close but the framed buttons look adorable! But again, a gorgeous black and white damask I have would be great in the first one as well. Hmmm… I like them all! What a super garment construction inspiration for these cooler days of winter (yes winter is finally here). I would love to win this pattern and thank you Nancy for yet another terrific inspiration and great give-away. I like them all, but lean towards #3 for ALL the creative juices used to create this one. Thank you Nancy, for all the years of sewing help. You are appreciated…. I love the Showcase on the Fabric. So chic. I need to win this book. I like the fleece and felting combo. So beautiful and fresh looking! I like them all, but especially the first one. The fabric on jacket #1 is beautiful. tis difficult to pick a favorite….I like them all. Upon contemplating which one I’d be more inclined to make right away if I were to win, I’d ‘go’ with the grey one. Such a warm, cozy look and feel! Great ideas for someone who is looking to make a few coats, jackets and a challenge. Thank you. Tough to make the choice but the fleece and felting combo wins. Very creative. I would happily wear all three but number one is probably the one I would go for first as the fabric and colour used is just fantastic! Button Combo #2 is my favorite. I would never have thought to felt fabric for buttons–great idea. Number 2 would be my vote. Love the big buttons!! I love Look 1 (showcase the fabric) as I love brocade fabric and this is perfect.